A certain celebration was required. After all, how many times does a star player return to a championship football team after suffering a stroke? A full house, with the much beloved Tedy Bruschi back in uniform for the first time since the Super Bowl, meant the Buffalo Bills should have been party favors, performing clowns at this festive gathering of Patriots faithful. With last night's 21-16 victory, the Patriots improved to 4-2 after bye weeks under coach Bill Belichick. It was the third time in the last six years that the Patriots faced the Bills following a week off. 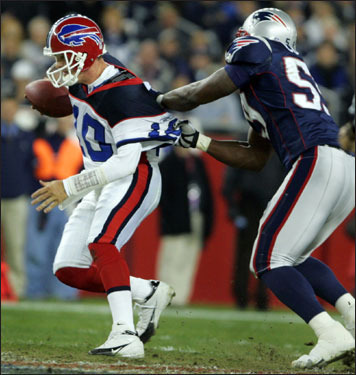 They lost to the Bills, 16-13, in overtime in 2000, Belichick's first season as head coach, and topped the Bills last season, 31-17, after byes. 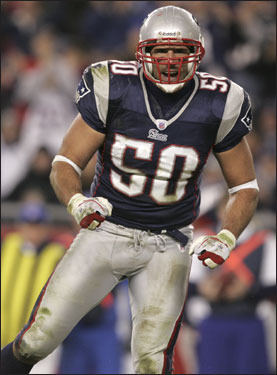 Tedy Bruschi survived. So did his team. Fixate on that and forget about the rest if you can. 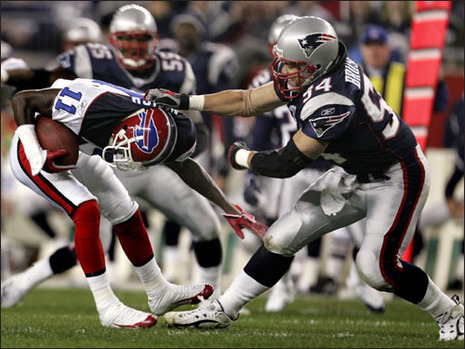 The Patriots won last night, beating the stumbling Buffalo Bills, 21-16, on a late score with 5:32 to play. Tell yourself the rest doesn't matter. They won the game. They didn't win by much and they didn't show any significant defensive improvement except inside the red zone but they won the game and for now that is all you've got to hold on to. For now it is enough. You know what they say: You've seen the last 10 minutes of an NFL game, you've seen it all. That's a joke, son, but just barely. For your defending Super Bowl champion New England Patriots did pack all their goodness into the final 10 minutes of last night's game, coming from a 16-7 deficit to pull out a vital 21-16 triumph over the Buffalo Bills last night.